We want potential sponsors to be able to meet the families directly whom they may wish to sponsor. 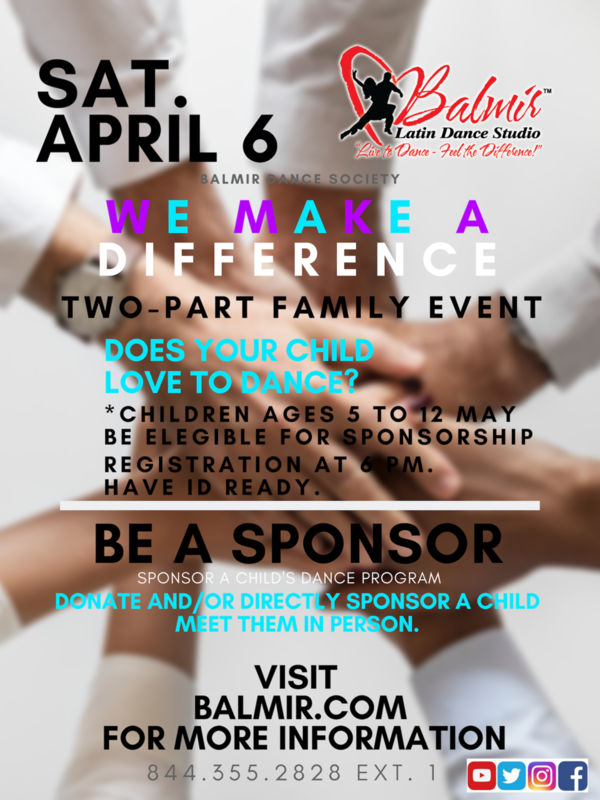 On Saturday, April 6, 2019, beginning at 5 PM, Balmir Dance Society will be hosting a three-part family day event and inviting our Brooklyn and NYC Communities to join us in support of our efforts, so that WE CAN MAKE A DIFFERENCE in the lives of certain Brooklyn families. We recently learned, from Shira Krasnow, a DOE dance teacher, who also teaches at Balmir, after-school and on weekends, that there are children attending Public schools in New York, Brooklyn specifically, who are homeless and do not have proper winter clothing [heart-breaking]. Despite facing these personal dilemmas, they enjoy taking dance classes (especially with Ms. Shira), but because of obvious financial hardships they cannot afford to do so. Balmir Dance Society and Shira K. have been sponsoring some of these children in order for them to take dance classes at our dance school since last month, February. We strongly feel kids should be able to pursue their passion for dance and not have to worry about attendance due to monetary hardships. We want to continue being advocates, taking action, making a positive impact on these families. We are asking for our community, local businesses, and anyone with the willingness and capacity to contribute to this positive impact, to do so. Students range from pre- k (age 4) to middle school (age 13). Many of these families also have babies and older kids in their households. Some of them are living in homeless shelters and some children are living with only one parent at home, who is struggling to make ends meet. • Sponsor a child's dance classes/program. 6:15 PM - 7:00 PM Donations Distribution and Potential Sponsorship Registration for Families. Sponsors who attend will be able to meet families they will be sponsoring. 7:15 PM - Closing Remarks. End of Event.